Those of us born between 1946 and 1964 face a daunting challenge. After dominating the landscape, it is our turn to step out of the way. Our legacy is uncertain. We can be associated with civil rights, voting rights, fair housing, gender equity, environmentalism, free love, the abortion holocaust, and the epidemic of drug abuse. We gave peace a chance and fought wars we couldn’t win. Our religion and politics could be explosive. Private wealth and the national debt grew on our watch as the middle disappeared. The sing-along at the nursing home is going to change when we get there. Our music was hard, loud, and made a statement. Kumbaya. We tried to keep the faith, baby. Did we? How will history judge our stewardship of life, liberty, and the pursuit of happiness? How will God judge our duty to bestow his values upon future generations? We are in our mellow years. If upon reflection there are things we regret, it’s not too late. “Even when I am old and gray, do not forsake me, O God, till I declare your power to the next generation, your might to all who are to come” (Psalms 71:18). And if there is such a thing as Boomer guilt, there is only one way to deal with it: “Repent and be baptized, every one of you, in the name of Jesus Christ for the forgiveness of your sins” (Acts 2:38). Get the restart you need in 2018! 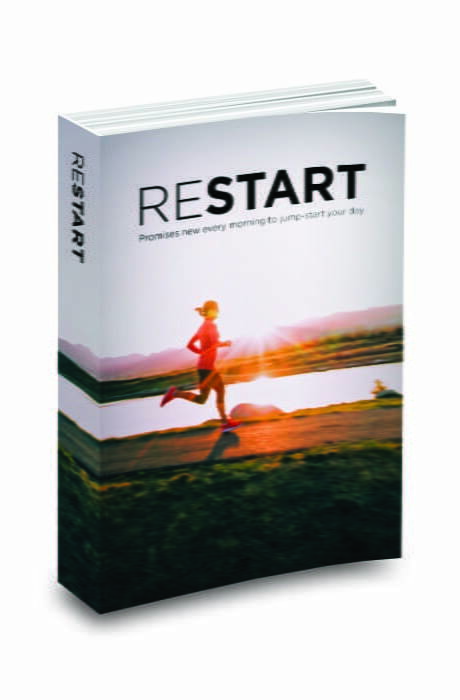 We want to help you get the restart you need in 2018 by sending you our 365-day devotional book, Restart: Promises New Every Morning to Jump-Start Your Day. As you immerse yourself in these daily devotions, you’ll gain a whole new perspective on God’s foundational promises—and grow in wisdom, forgiveness, reassurance, spiritual insight, and strength.